The recent paper submitted for publication by the Berkeley Earth team would appear to rule out any effect from urban expansion on global temperature anomaly measurements. They selected data from stations classified by MODIS 500 as being “rural” and then compared resultant global trends from these just stations with the full set. They find no effect whatsoever and their conclusion is that urbanisation is a non-issue regarding global warming. Still not fully convinced, I decided to try a different approach and identify those stations which show the highest anomaly warming from 1890 to 2010. The use of anomalies to measure global waring is a subtle issue because there will be no difference between a “hot” city compared to a “rural” station unless that city has seen a larger differential increase in the localised heating (urban effect) over time. I therefore carried out a new study using the station data provided by the UK Met office to identify those stations which have warmed the most since 1890. The table below shows those stations where the measured temperature anomaly averaged beween 1991 to 2010 (A2) is greater than 1 deg.C above that measured between 1891 and 1920(A1). DA is the difference (A2-A1) measuring net “warming” over the full period. Each identified station was then classified by hand using the world-gazeteer as being a City/Town/Urban based on the total population. The results are shown below and ordered with the largest warming effect first. Clearly some of the fastest growing cities , but do they actually effect global measurements ? PEORIA USA -0.48 0.75 1.22 ? There are indeed many large cities in the list which have grown over the last century, particularly Sao Paolo and Beijing.So at first glance this looks like direct evidence that urban warming could well be skewing the overall result. To investigate this possibility I excluded all the cities in the above list with a population greater than 0.4 million and recalculated the global average anomalies over the full time span. The result is surprising – there is no effect – see figure 1! It is indeed true that urban warming does not systematically effect the overall trend in global temperatures. Figure 1: Comparison of the land station data CRUTEM3 with and without the warmest cities listed in the table. So the conclusion is more or less the same as the BEST result. 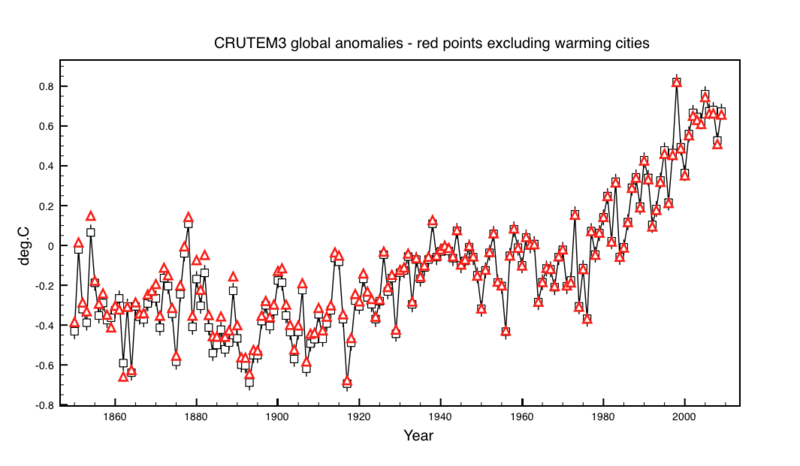 Observed increases in global temperature (anomalies) are not effected by large urban areas. I am convinced. This entry was posted in Climate Change, climate science, Physics, Science and tagged Climate Change, Urban Heat Effect. Bookmark the permalink. Would you care to comment at Roy Spencer’s blog on possible differences between your work and his? To locate weather-stations is not easy. AFAIK Saentis and Sonnblick are mountaintops; Villacher Alpe and Hohenpeissenberg are hills, Kremsmuenster is within the walls of a monastery, Salzburg and Lugano seem to be airports as may be Vienna (or hill). The population numbers are not really reliable.